This article will walk you through the steps of the cPanel Getting Started Wizard. This article is a recommended read for any first time cPanel user. Essentially, cPanel allows you the ability to completely manage all aspects of your web hosting account (including FTP, e-mail, databases, DNS, etc.) from a web-based administration interface. 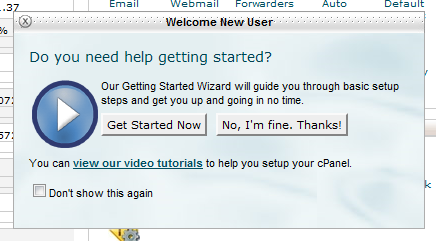 When you first login to cPanel, you will be presented with the Getting Started Wizard interface. We recommend that all users complete the wizard. If you've skipped the wizard and would like to go back to it, navigate to Preferences >> Getting Started Wizard. On your next login you can hide the Getting Started Wizard by selecting "Don't show this again" at the bottom of the wizard's interface. On the next step of the wizard, you are presented with the ability to set your language preference. cPanel is translated in 17 different languages. You can always adjust your language preference in the future by logging into cPanel and then navigating to Preferences >> Change Language. On the next step of the wizard, you are introduced to the file structure of your web hosting account. 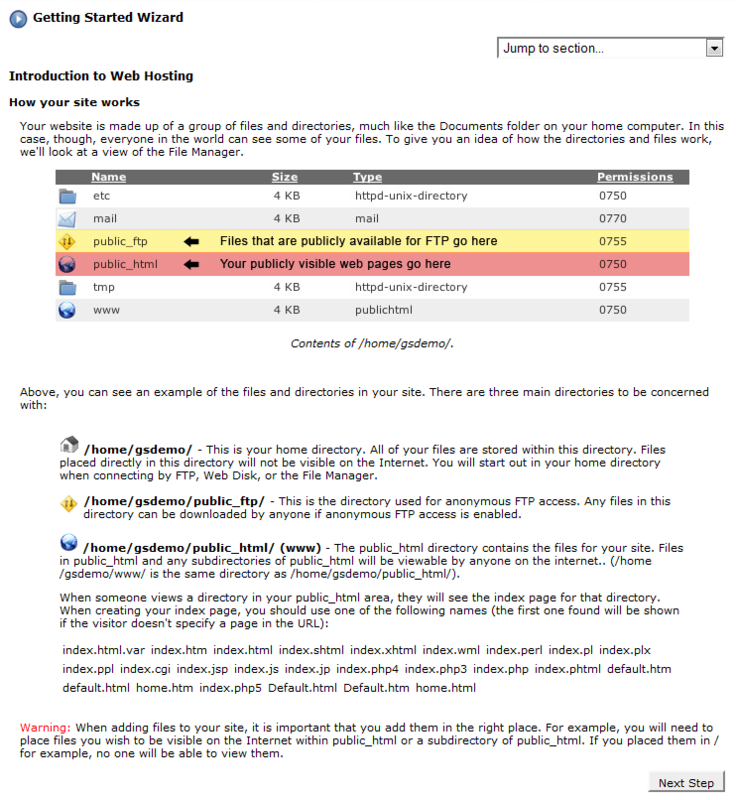 As noted below, any files you wish to be visible to the public need to be placed in your account's public_html folder. 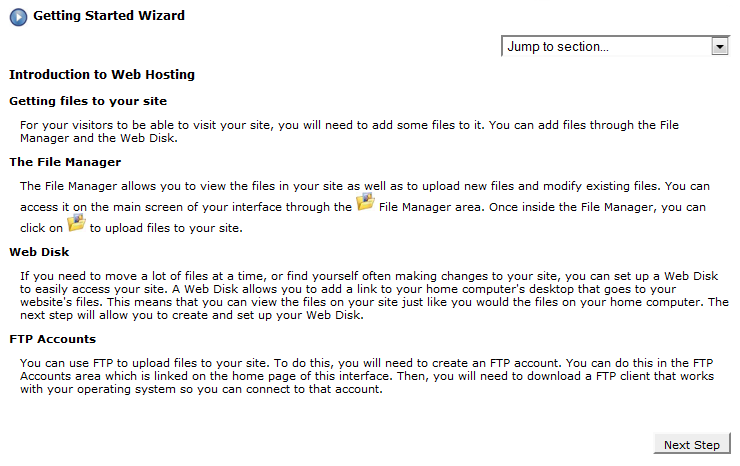 The next step of the wizard explains three common methods of adding (or uploading) files to your website. The File Manager is accessible through your cPanel and allows you to manage (add, modify, remove) all of your website's files. The most common method to add (upload) files to your web hosting account is using FTP Software (click here for a list of recommended FTP Software) to connect to your account through an FTP user. If you are not familiar with FTP, the File Manager is a great place to start. You can access the File Manager by logging into cPanel and then navigating to Files >> File Manager. 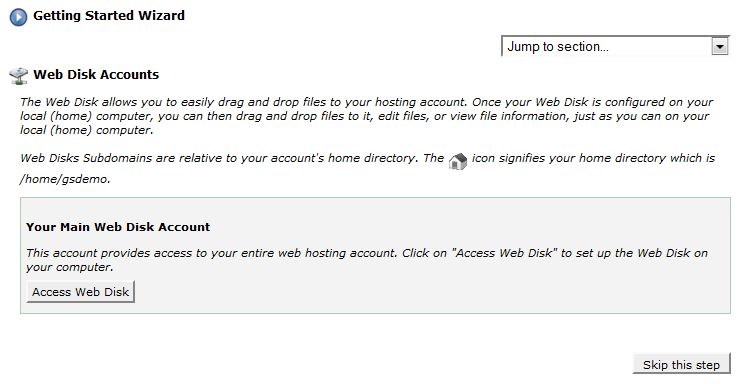 You can access Web Disk by logging into cPanel and then navigating to Files >> Web Disk. You can add, modify or delete FTP accounts by logging into cPanel and then navigating to Files >> FTP Accounts. The next step of the wizard introduces you to Web Disk. Web Disk can be setup on your home or work PC to easily modify your website. You can configure this later by logging into cPanel and navigating to Files >> Web Disk. 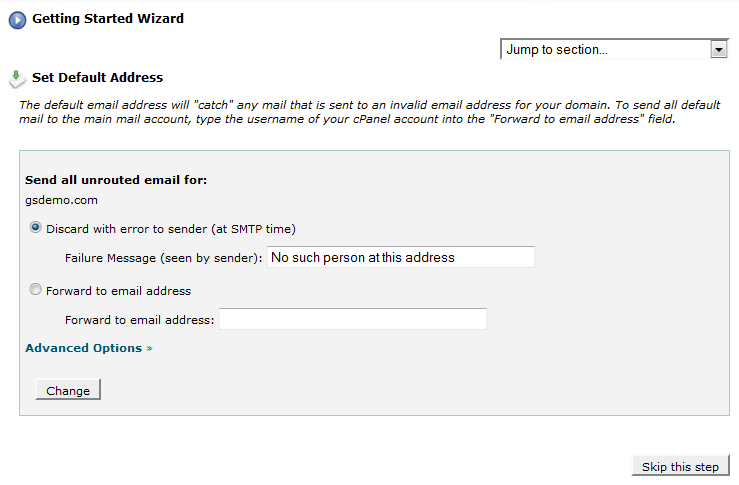 The next step of the wizard gives you the option to create an e-mail account. We recommend creating an account at this step, as you will be asked later in the wizard to specify an e-mail address for important account notices. 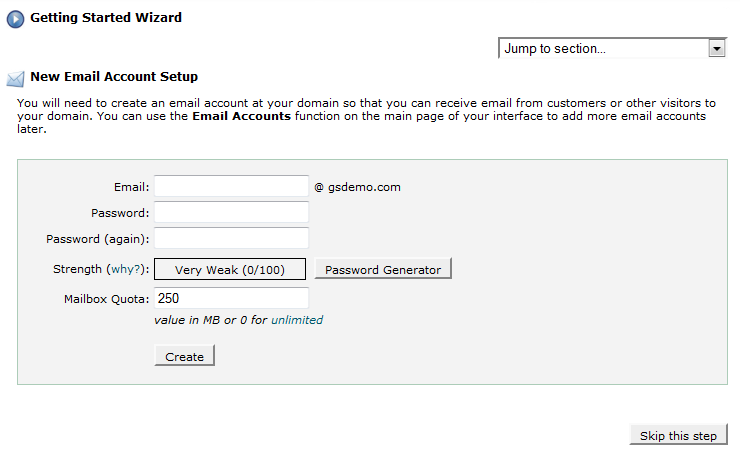 You can create additional e-mail accounts by logging into cPanel and then navigating to Mail >> Email Accounts. In this step of the wizard you can specify what action the mail server should take when someone sends an e-mail to a user on your domain that doesn't exist. We recommend creating a catch-all forwarder and sending the e-mail to an e-mail address. If you choose "Discard with error to sender (at SMTP time)", any e-mail that is sent to a non-existent user on your domain will bounce and not be delivered to you. You can modify the default e-mail address by logging into cPanel and navigating to Mail >> Default Address. 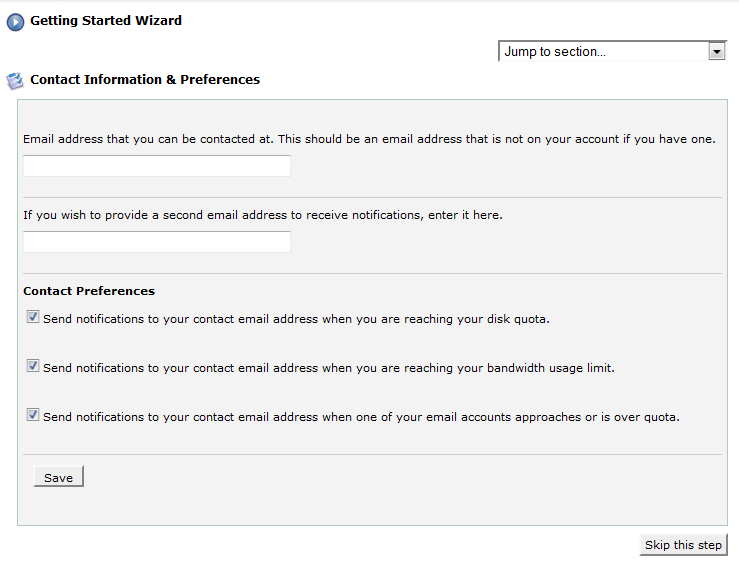 This step of the wizard introduces you to webmail. We have three webmail programs installed on your account by default (Horde, SquirrelMail and Roundcube). You can access your webmail by logging into cPanel and navigating to Mail >> Webmail. The next step of the wizard allows you to specify a primary and alternate e-mail address to be the recipient of important account notices (disk quota and bandwidth usage notices). We recommend that you add at least one e-mail address to receive these notices on your account. This is the only method available to receive these account notifications. Failure to add a contact may result in you missing out on an important account notification! You can update your contact information and preferences by logging into cPanel and navigating to Preferences >> Update Contact Info. 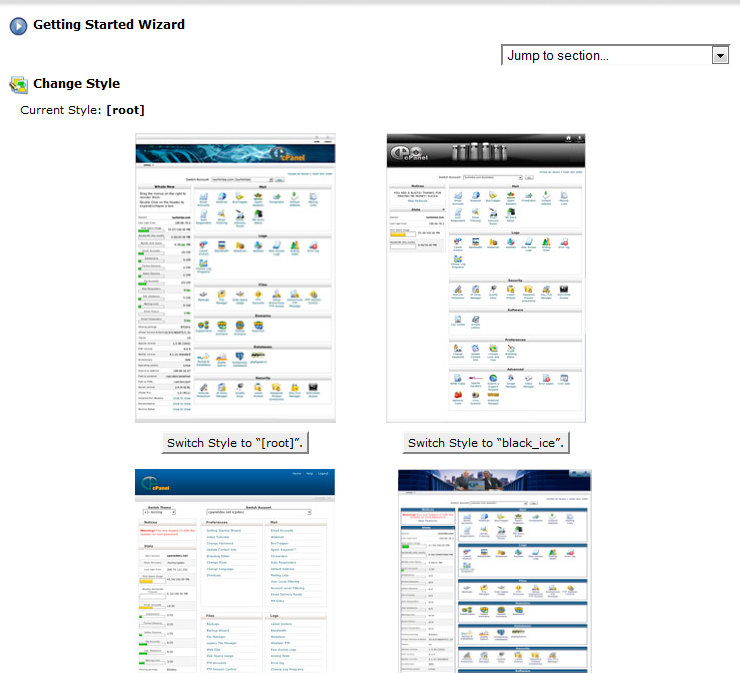 This step of the wizard gives you the option to change your cPanel style. You can adjust your cPanel style by logging into cPanel and navigating to Preferences >> Change Style. This step of the wizard allows you to create an SSH Key for your account. If your web hosting plan includes SSH, we recommend creating an SSH Key. If your web hosting plan does not include SSH access, you can skip this step. Getting Started Wizard - Completed! You are all set with the initial configuration of cPanel! We recommend becoming familiar with cPanel by browsing through the control panel. We have video tutorials that walk you through every aspect of your cPanel, available here. Looking to move to a new host with our website, Fathers4Justice. Need to test drive CPanel.